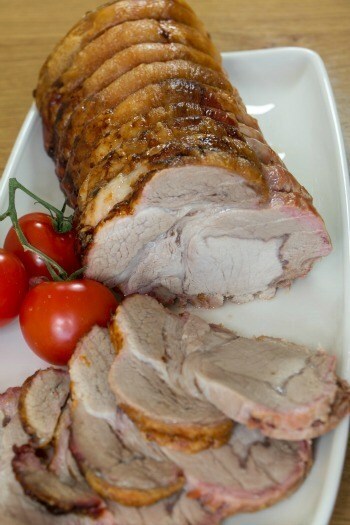 Visit our Shop to view our Pork Loins. While the oven is preheating, score the fat on the meat with a sharp knife, cutting half ways through the depth of the fat. To do this make slits about ½ inch apart and then in the opposite direction so that you end up with a criss cross pattern. Now place the pork in a roasting dish and using about 1 tablespoon of coarse sea salt to sprinkle all over the fat, pressing it in as much as possible. This will give a nice crunchy finish to the meat. Place the pork on the top shelf of the oven and roast for 25 minutes. Turn down the heat to 190c/375f/gas 5, calculating the total cooking time allowing 35 minutes to the pound. This size joint will take just under 3 hours in total. There’s no need to baste pork when cooking as there is enough fat to keep it moist. To tell when it’s cooked, insert a skewer in the thickest part of the meat and the juices that run out should be absolutely clear without any trace of pink. Allow the meat to rest for 20 minutes before carving. If you are using a rolled and tied Pork Loin the cooking time will be increased as it is much thicker but the same 35 minutes/ lb applies.